Democratic congressional candidate Amy McGrath stands in line with her family while waiting to vote on Election Day in Georgetown, Ky., on Tuesday. WASHINGTON — The Democrats flipped their first two Republican-held House seats Tuesday in Florida and Virginia but fell short in a closely watched race in Kentucky as they fought to wrest control of the chamber from the GOP and confront President Donald Trump. With polls closing across the East, one of the top Democratic recruits, retired Marine fighter pilot Amy McGrath, lost her bid to oust to three-term Rep. Andy Barr in the Lexington-area district. In the Miami area, former Clinton administration Cabinet member Donna Shalala defeated television journalist Maria Elvira Salazar in a costly, roller-coaster contest. Virginia Rep. Barbara Comstock — among the most endangered GOP incumbents, branded Barbara “Trumpstock” by Democrats — lost to Jennifer Wexton, a prosecutor and state legislator. She was among the record number of women running this year. Both of those Democratic gains were in districts the party eyed for turnover in part because they were won by Hillary Clinton in the 2016 election. A Democratic majority in the House would break the GOP’s monopoly on power in Washington and give the party a check on Trump’s agenda . It would also almost certainly bring an onslaught of investigations of his businesses and his administration. Midterm elections are typically difficult for the party in power, and GOP incumbents were on defense in races across the country. More women than ever were running, along with military veterans and minorities, many of them motivated by Trump’s rise. The debate was dominated not by the GOP’s $1.5 trillion tax cuts but by Trump’s dire prediction of “invasion” from the migrant caravan and what he called the “radical” agenda of speaker-in-waiting Pelosi. GOP Whip Steve Scalise said the president’s rallies were building momentum, and with the economy a selling point, he predicted his party would retain a slim majority. “In the end, we hold the House because of the strong economy,” the Louisiana Republican told The Associated Press on the eve of Election Day. Health care and immigration were high on voters’ minds as they cast ballots, according to a wide-ranging survey of the American electorate conducted by AP. AP VoteCast also showed a majority of voters considered Trump a factor in their votes. For Democrats, the road to the 218-seat majority ran through two dozen suburban districts Hillary Clinton won in 2016 and through swaths of Trump country in the Rust Belt and heartland where voters backed the president. It was a deliberate strategy to expand the playing field to about 80 districts, stretching beyond college-educated voters in the suburbs into regions where the party has seen its fortunes fade. How women and independent voters cast their ballots was likely to determine the outcome. Hundreds of millions were spent by the parties, supplemented by more money from outside groups, to frame the debate. Billionaire Michael Bloomberg, who advocates gun control, poured millions into House races for Democrats, offsetting the big-dollar spending to save Republicans by the Congressional Leadership Fund, which is aligned with House Speaker Paul Ryan. Republicans still had advantages in some areas, giving them hope of retaining a slim majority. Trump had been tweeting support for specific GOP candidates, even as he acknowledged potential losses by emphasizing that his focus was on the Senate. Ballot counting could drag in tight races, leaving some races undecided long after Election Day. 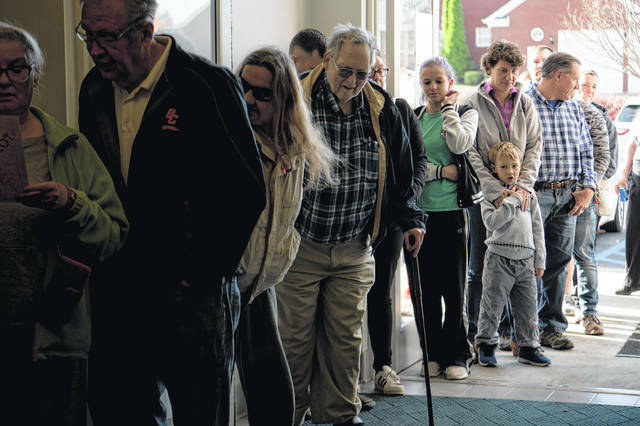 Several districts on the East Coast with early poll closing times were among those watched Tuesday for signs of the electorate’s mood. Outside Richmond, one-time tea party favorite Rep. Dave Brat faced an unusually strong challenge from Democrat Abigail Spanberger, a former CIA operative motivated to run for office after the GOP vote to gut the Affordable Care Act. Like other Democrats across the country, Spanberger emphasized protecting people with pre-existing conditions from being denied coverage or charged more by insurers. The GOP’s hold on the majority was complicated by an unusually large number of retirements as well as persistent infighting between conservatives and centrists, with much of the conflict centered on the question of allegiance to Trump. Pennsylvania looked particularly daunting for Republicans after court-imposed redistricting and a rash of retirements put several seats in play. Democratic favorite Conor Lamb stunned Washington by winning a special election in the state and faced Republican Rep. Keith Rothfus in a new district that was among four that could flip from red to blue. Other seats in the state were also considered in play. In North Carolina, Republicans were struggling to hold onto a seat where Baptist minister Mark Harris ousted a GOP incumbent in the primary. Harris was facing a stiff challenge from Marine veteran and small-businessman Dan McCready. The tax law has been particularly problematic for Republicans in New Jersey, where four of five GOP-held seats were being seriously contested. Democrat Mikie Sherrill, a former Navy pilot and federal prosecutor, was favored for a suburban Newark seat that became open after the sudden retirement of the powerful chairman of the Appropriations Committee. An open seat that included Atlantic City was also ripe for Democratic pickup by state lawmaker Jeff Van Drew after the GOP campaign committee abandoned Republican Seth Grossman over racially charged comments. The committee also distanced itself from eight-term Rep. Steve King of Iowa after racial remarks, and his seat was unexpectedly contested in the final week of the campaign. The fight for control of the House could come down to a handful of seats out West, particularly in California, where the GOP’s one-time stronghold of Orange County voted for Clinton in 2016. Four GOP seats in Orange County, including two where the incumbent Republicans retired, were in play, along with three other seats to the north beyond Los Angeles and into the Central Valley. This entry was tagged Election. Bookmark the permalink.